Spiders are hostile monsters at night but will be neutral during the day. They will spawn in the Overworld during the night or places like caves where there is virtually no light. When killed Spiders drop between 0-2 String, 0-1 Spider Eye and 5 experience points. 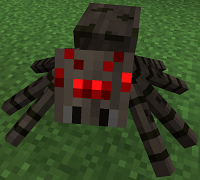 Spiders are able to spawn with a Skeleton on their back making them a Spider Jockey. It is good to note that Spider Jockeys are very tough hostile mobs.